This weekend I'm in my childhood home: a tiny lobster fishing village of 500 people in rural Nova Scotia. 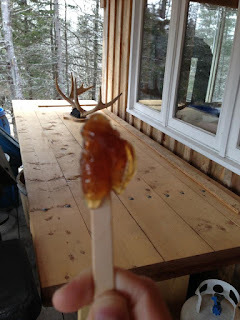 A few years ago, a local lobster fisherman decided, for fun, to start tapping some maple trees and making some maple syrup. Traditionally, Acadians have been tapping and making maple syrup and 'la tire' for centuries (it's definitely not the monopoly of the Québécois). 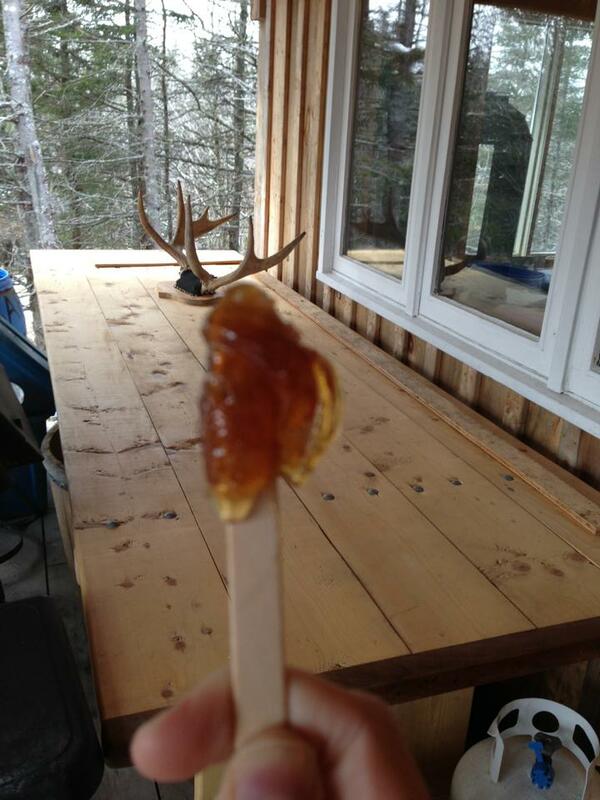 When I was younger, there were several 'Cabane à sucre' in the area, but that had gone to the way-side. 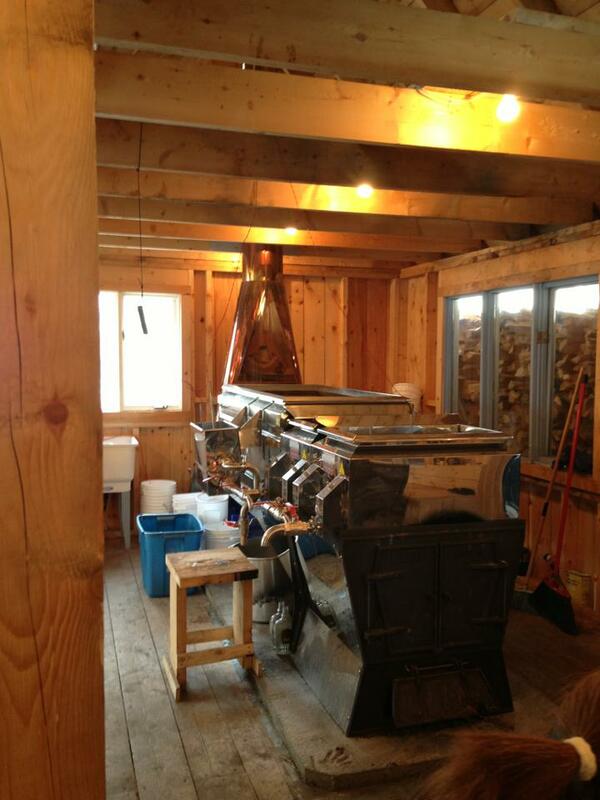 Until this lobster fisherman and his family started boiling syrup in their shed just because. They bottled it and gave it away for free and in return several families along the village road started adding buckets to their trees. After a few years it became evident that the syrup was bringing the community together and the fisherman decided to expand. With the help of other fishermen, they built the 'Sugar Shack', ordered a specially made syrup processing machine and tapped more than 600 trees in the village. 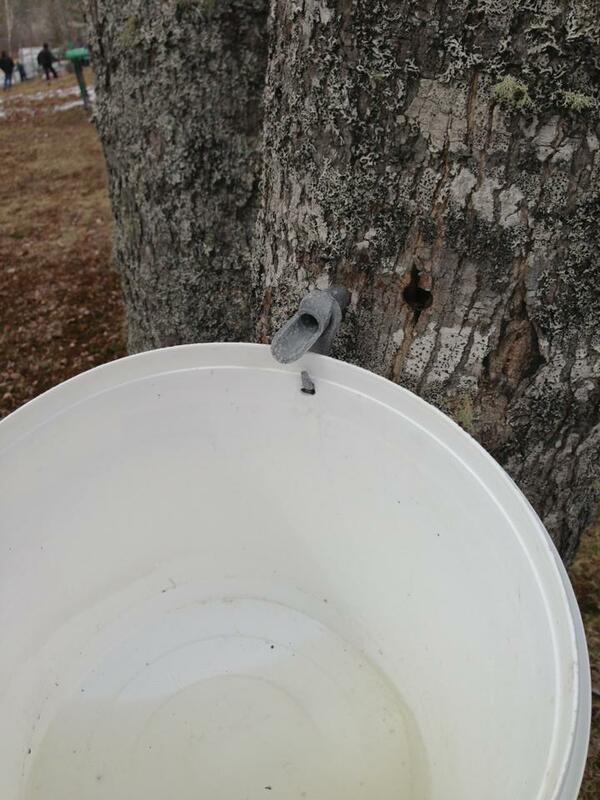 Now, white buckets dot the trees all along the village and people come from all around to visit the Sugar Shack. Today was the grand finale where the last batch was cooked and poured over snow to make taffy. 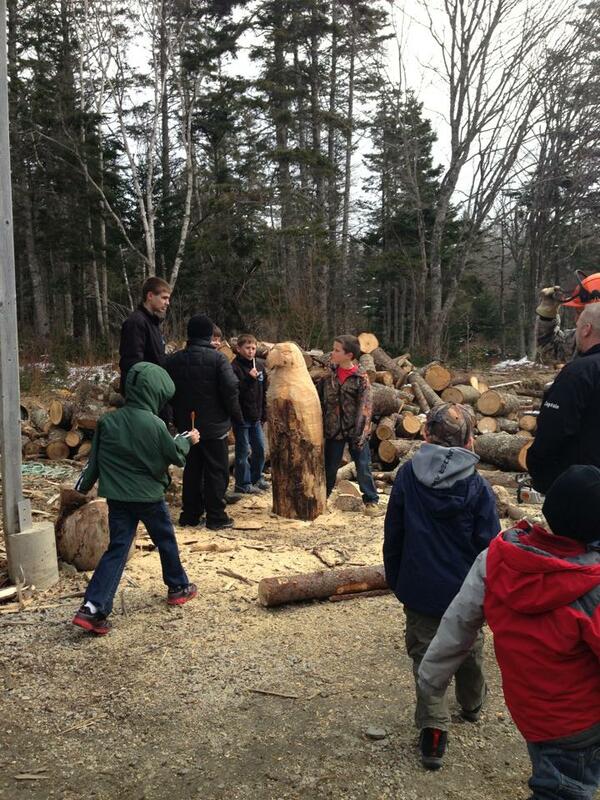 A fisherman from a neighbouring village came to carve an eagle out of wood with his chainsaw. As the snow gently fell, it was a beautiful moment where neighbours and families gathered to chat and children learned and played. The fisherman now has friends and family who help cook and bottle the syrup and people stop by to gather, connect and chat. 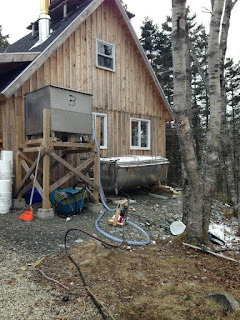 It has become a real gathering point in a community during a time where the lobster fishermen have had to fight to get a fair price for their product and jobs are disappearing. The Sugar Shack is a beautiful example of why rural living can be so much more wondrous and meaningful than urban living. As our population moves toward the city, I feel we often lose this sense of connection and community and as a result rely on ourselves. We need to find a way to stop scoffing rural living and see the lessons to be learned. First - great story and photos. However, I take issue with the generalization that those who lives in cities scoff at rural living and don't have a sense of community. I know every one of my neighbors, have babysat for a few, barter with others, and one built the deck on my house for me. Within three blocks there are three coffeeshops, a pub, and two restaurants serving locally sourced foods - all places where nearly every time I go I run into a neighbor or friend. These urban homesteaders are community as well and it's not the city that makes people separate - I dated a farmer who lived on 800 acres once and he had no clue about community like we have in our neighborhood. People choose whether or not to engage, and there are cites and small towns alike that celebrate this, and others of both sizes that are completely disconnected. EcoGrrl: that's a good point- and I apologize if I offended- wasn't my intention. I do live in a city and have lived in cities for the past 13 years. I guess it's simply an observation of living in both rural (19 years) and city (13 years) that have shaped this perspective. You're right though, that it is what we choose. I would say that rural living encourages more connection than urban living. You have to actively seek out connection in the city whereas in rural areas it comes more easily and often is almost forced upon you. I would also say that the new generation of farmers may not exactly be representative of rural living. 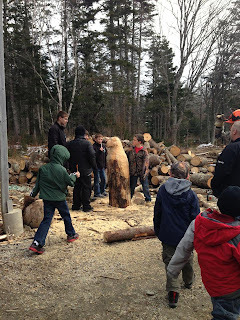 In Nova Scotia in any case, there is a whole population of young farmers who are moving out from having lived in Suburban, urban areas all their lives to become farmers. Which is great, but often they have no basis as to how to connect or what it means to live rurally. Also- it probably doesn't help that the double edged sword of rural living is that if you are not from there you will always be 'from away'. Which can be challenging for some. in any case- I think you make an important point- that it's not as black and white. This Sunday we took our kids to a syruping demonstration at our city parks. 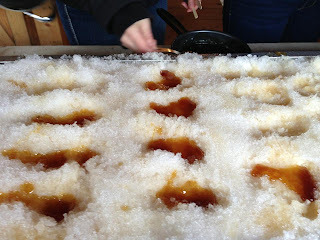 Who knew that maple syrup could be made as far south as Indiana? 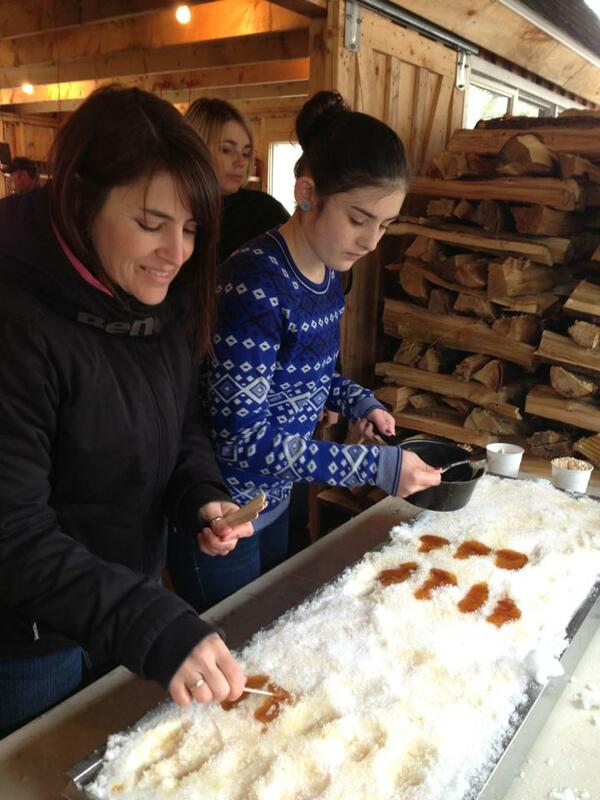 It was a wonderful learning experience for them to see how syrup was produced, and we bought several bottles of Indiana-made maple syrup they were selling as a fundraiser. I will have to post my photos as well! One thing that rural living has going for it is sense of place and identity. In communities with lots of transiency (many urban/ suburban areas), it's hard to make connections. Or it often doesn't seem worth it (i.e., they'll be moving soon anyway).